Lunch, lunch, lunch…. I’ve been crazy about good lunch spots in town for quite a while and we decided to try out a small Korean eatery hiding in one of the many plazas on Rundle Mall. On offer in the cafe are 8 dishes ranging from $7.50 to $9.50 and most of them are vegan. I was actually a bit doubted about the quality of food before ordering. Oh, well, never mind. There’s no time for me to go somewhere else. So, for two of us, we ordered three dishes. Tempura Vegetables $7.50. See folks, I told you, this place is very vegan friendly and almost all of their dishes are vegetable based :D. Anyway, this dish taste good with some soy sauce and sesame seeds. I think the cafe has misunderstood the word “tempura” and most of Australians does. “Tempura” is a special way of deep-fry in Japanese cooking with a very difficult to make paste/coating. 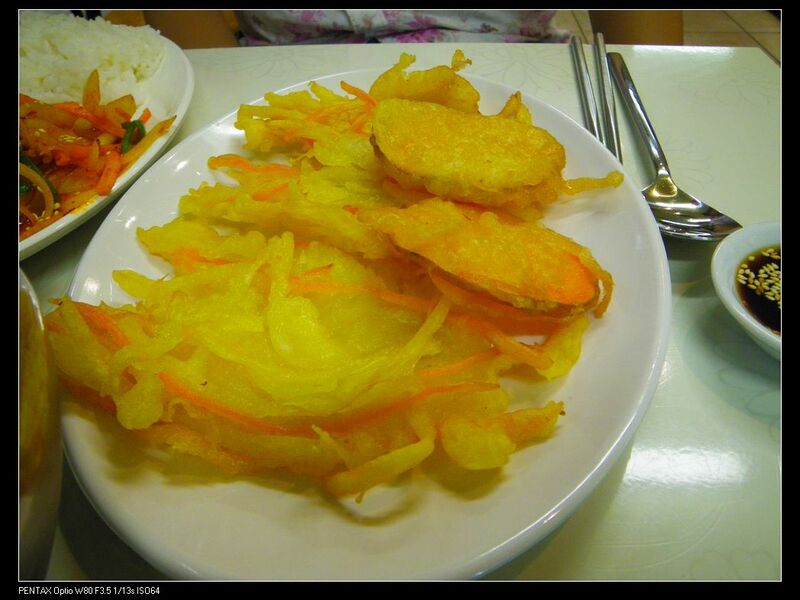 Hence, NOT ALL deep-fries are tempura and this dish should well be renamed as “Deep Fried Vegetables” or some Korean word pronunciations. Here it comes my favorite and the specialty of this cafe, Naengmyeon! Some of you may think “what the hell is this word?” Yes, it is Korean and it basically means “cold noodle”. 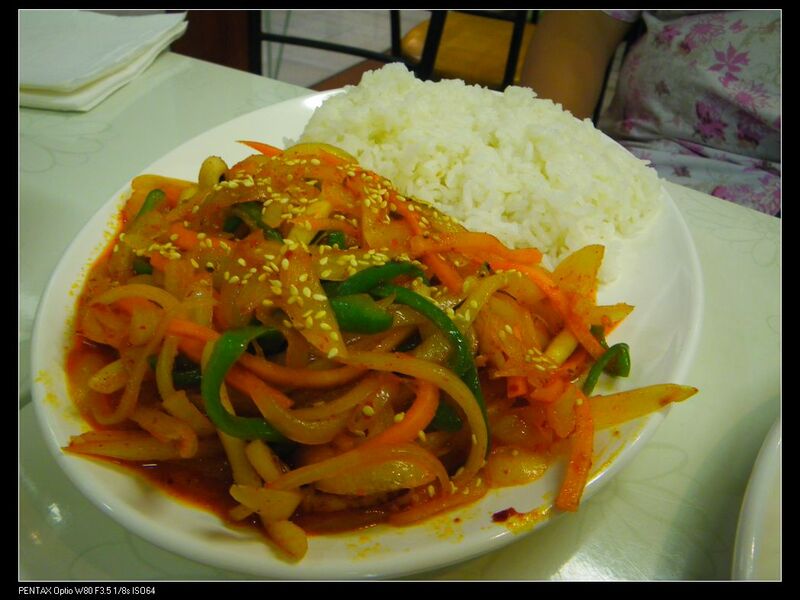 This dish is surely their specialty and is definitely something you may be craving for in a hot summer day. The noodle is cold so as the soup which is sour and icy. With the addition of a sprinkle of cucumbers and some special “weapon”, this dish is refreshing especially in summer and for work breaks. The special something I was talking about is vinegar block. Yes, the owner is clever and has pre-frozen some vinegar blocks and when serving this dish, these blocks are thrown in and they will gradually be melted. With the addition of some Korean mustard sauce, the flavour is awesome. Textures, refreshments, spicy mustard and sour vinegar are perfectly combined in the soup and the noddles are very tender. I just love it. If you ever get a chance to try this dish, taste it and feel the complexity and simplicity it has to offer. In fact, this is one of the very few top Naengmyeons I’ve ever had around the world, no matter it’s in Australia, China or in Korea. 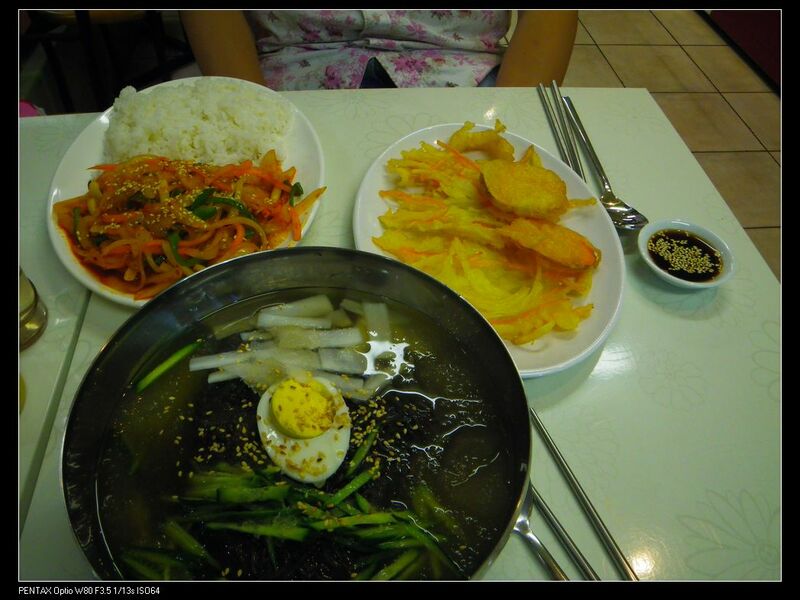 Overall, I am happy with the food served, especially the Naengmyeon. The service is a bit down as the owner speaks hardly any English and this has made our communications even more difficult, but at least she’s happy to help out. 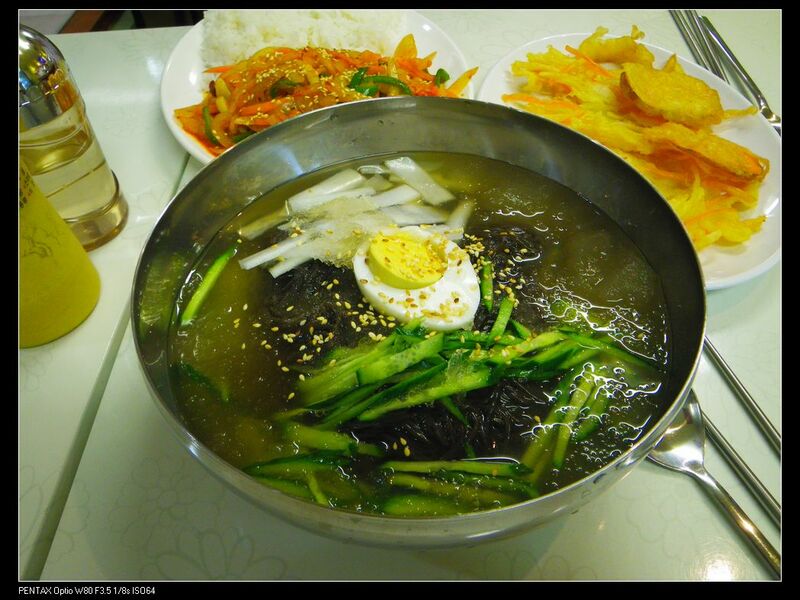 Food: 2.5/5 Generally speaking, their food isn’t that fancy except Naengmyeon. Value: 2.5/5 Not very cheap though when you think about almost purely vegan food. Wow. That’s not a nice comment, but you’d better know what you are talking about! Tempura is clearly a Japanese dish and it is a way of deep frying. If you think all deep-fries are tempura, then you are absolutely wrong! I’ve worked in a Japanese restaurant before and can tell you for sure that the batter is hard to make. Definitely more complicated than beer batter paste! Tempura was originated in Portugal and was brought to Japan in the 16th century. Outside Japan, the method was mainly used as fusion cuisines! If you don’t understand something, you’d better shut up until you know how to cook. Adelaidefoodies have put up this blog and we can all benefit from reading it. We can get what-so-ever info we want and discard the rest. Plus, tempura batter does not always involve eggs. It’s an optional addition although many restaurants do add it. 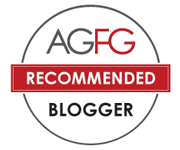 I like reading Adelaidefoodies’ blog and was never felt being alienated and belittled. If you think in such a way, just leave this blog. Put up your own please!!!!! You such an arrogant bag! Don’t worry Adelaidefoodies! I am a regular visitor of your blog. My husband and I always support you. Also, just to educate you, Korean tempura is a misuse of the name. Tempura outside Japan are mainly used in fusion cuisines! Read Wiki on the following page.